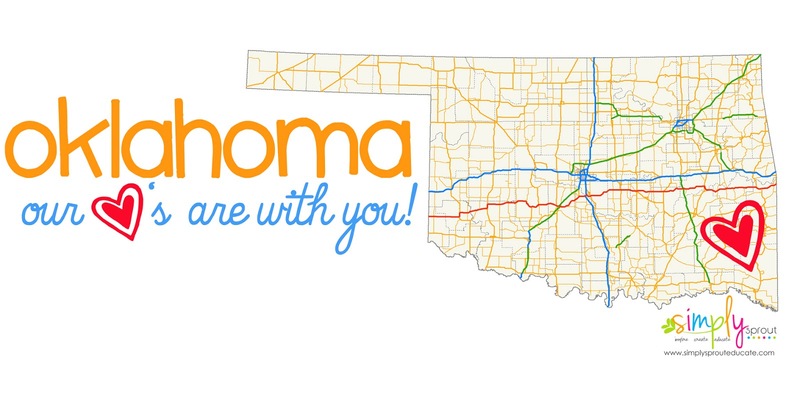 To the Families in Oklahoma, while nothing can replace what has been taken by this devastating disaster we hope that you feel the love and support, from teachers and educators around the country. Our hearts and prayers are with Oklahoma! Simply Sprout has teamed up with our friends and colleagues at Teacher's Notebook to create the biggest teacher created relief bundle ever! Teacher's notebook authors have donated items from their shops to create a bundle of activities and materials for teachers. The bundle of donated products will be available on the site, just follow the link below. They are priced at $20, $25, $50 and $100. Regardless of the amount a member contributes, they will have access to all of the donated products, 100% of the proceeds from the sale of this bundle will go directly to local relief efforts in Moore, OK. Your contribution is vital to the success of this relief effort and will go a long, long way for the victims. It will provide food, supplies, clothing and much much more. The bundle will be available until Tuesday night, May 28th to those members who purchase the bundle, at which point it will no longer be available for purchase. Our goal for this relief effort is to raise as much money as possible for those people who have suffered such a horrible tragedy. They need our help. We are reaching out to everyone we can and we need your help in spreading the word about this relief effort. Our hearts are saddened for all of the families affected by this devastating tragedy. We are asking our community of teachers and educators to join forces to help restore homes, churches, and schools. Together we are strong, we are teachers. Some of us are moms or dads, and can't even imagine the incomprehensible pain and suffering the families of Oklahoma are going through. So let's help in a big way. Please help Moore OK. and show your support. Share! Share ! Share!